I hate to admit it but Summer in my home is almost over. My 3 kids will be heading back to school in a few short weeks. As we near the back-to-school season I am always looking for article ideas that can help make students lives a little bit easier. Since we live in the go-go “there’s an app for that” culture I thought it would be cool to research 5 great smartphone apps that can really help high school and college aged kids. I was totally blown away with what I found. If you were like me, in math class, you were always fumbling through the text book looking for the correct formula. Then once you did find it you couldn’t remember how to plug the dang numbers into it. I still have nightmares about my pre-calculus class, but that is a post for another day. I would have absolutely loved the free iFormulas app for the iPhone. It has hundreds of math formulas right at your fingertips, and the best part is it allows you to add the ones you use the most into the “Favorites” folder. What a great idea for an app. I totally was born 20 years too late. If you are heading into a class where you have to memorize vocabulary words or definitions, the Flashcard Touch app may be the best 99 cents you ever spent. The app is very simple to use and gives you access to over 1 million pre-made flashcards as well as the ability to quickly create your own. CueBrain! 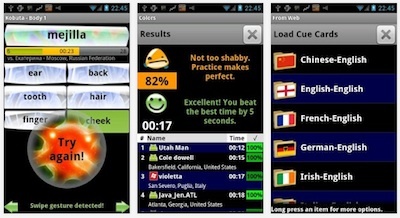 is an amazing little app that allows you to learn over 20 different languages in a fun quiz-style format. Popular languages include English, French, Spanish, German, and even Chinese. Essentially the app allows you to build cue cards and then uses the cards to quiz you in a fun and interactive way. Also, if you own an iPhone you can download the free version and give it a test drive before you buy the full $3.99 version. 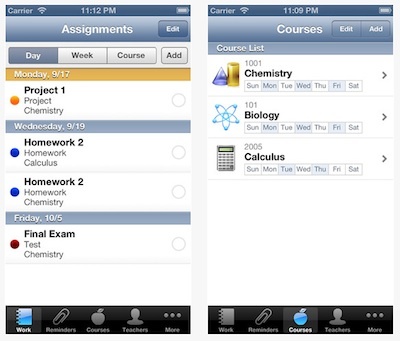 The only way this app could be any cooler was if it did your homework for you! From their iTunes page, the app “keeps you up-to-date with your school work, grades, to-do’s, teacher’s information, and almost everything else you need during the school year.” No more excuses as to why you didn’t get your assignments turned in on time. Pretty cool. The app also allows you to record your own grades so you won’t have any surprises when your report card shows up on your parents kitchen counter. If I were still in college I would use the Wikipedia app to get a little extra or bonus information about whatever topic was currently being covered. The app is essentially a free encyclopedia on your phone with more than 20 million articles currently archived. Since Wikipedia is open source, and allows for user contributions, I probably wouldn’t cite it when doing research papers. Another thing students should NOT do is pay full price for anything when back-to-school shopping this year. Here are some great coupons to make this a reality. Happy savings! About The Author: Kyle James founded a site called Rather Be Shopping.com back in 2001 which helps consumers save money with online and printable coupons to over 850 stores. I’m downloading iFormulas right now! Hey Lisa, yeah, it’s pretty awesome! I needed iForumlas in high school. Our teacher always let us keep a notecard with formulas on it for tests. I’m a dinosaur. I totally remember that! You would cram all of the formulas on 1 note-card but the writing was so small that by the time you needed it you couldn’t read it! These will come in handy for sure! I totally was blown away with the sheer number of apps available for students. this literally was just the tip of the iceberg. I need to tell my students about the flashcard one! It really is a cool app, I think they’ll love it. I wish they’d had iFormula when I was taking math classes. It took forever to search through the math book index and find them! Hey Liz, no kidding! I may have gotten a C in pre-calc instead of a D.
Thanks for sharing these apps…I’m definitely checking these out. Have a great day! You too Corina! Small world, glad to see you on Donna’s blog. Thanks for sharing the apps (and coupons). I like being able to test drive the LITE version before paying for one I may or may not like. Agreed, having a Lite version available is such a great idea. Any app developers reading this? Listen up. Thanks so much for sharing these apps. Just in time for back to school! So helpful! 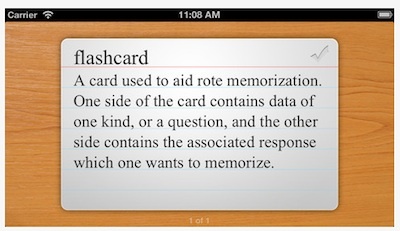 Flashcards touch and cue brain sound awesome! 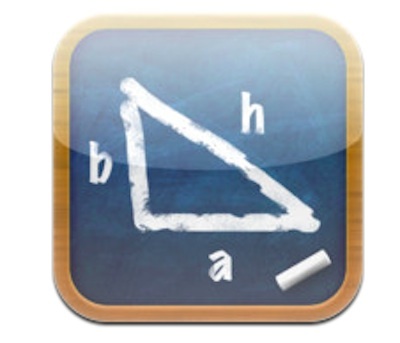 We’ve been using iFormula for a couple of years now to help with math in our home school classes, it’s a great app. Ooooh – how awesome would it be to learn a new language! These are great apps and I don’t think I’d heard of most of them before. I wish I had a smartphone when I was in school! I HATE that summer is almost over. That iHomework app looks like it could come in quite handy.